Warning: this review contains multiple spoilers for The Walking Dead Season 9, Episode 9. The death of Jesus in Episode 8 was the signal that the Walking Dead world had truly changed, with walkers actually fighting back, using tactics and weapons. Then came the terrifying discovery that these weren’t actually walkers, but people wearing walker skins. In Episode 9, the implications of that discovery were revealed. This wasn’t just a few people (or 10 people, as Lydia claimed) but dozens, perhaps as many as a hundred or more. The large numbers appearing like Children of the Corn in the forest to confront Alden and Luke were meant to be menacing, and they were. The Whisperers are real, they are here, and they are a threat. 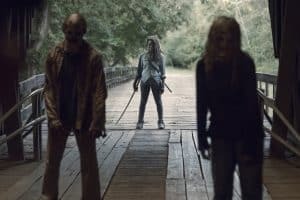 Although the Whisperer leader’s name has yet to be revealed on the show, statements from Robert Kirkman and discussion on Talking Dead confirm that her name is Alpha, as it is in the comic series. She is indeed Lydia’s mother, and she is nearly devoid of compassion. When she points that shotgun at Luke and Alden, it is clear that she knows that she has the upper hand, and that she means business. I suspect that she will leave at least one of the two men alive to carry a message back. But she doesn’t need two people for that. It may be Alden’s turn to go. Of course, it could be Luke, but it feels like Luke still has storyline left to pursue, while Alden’s character hasn’t really done much (other than ‘steal’ Enid’s affections away from Henry). I’d like to see both Alden and Luke survive this encounter, but if one dies as an indication of the seriousness of it all, I’m betting that it is Alden. The Whisperer threat also brought home Michonne’s stance to Aaron. After seeing Jesus killed, Aaron told Michonne that she was right, that they should be ‘inside and protected, taking care of each other’. For Aaron, who was once the scout of Alexandria, tasked with bringing in new people, saying this is a sign of a significant change in outlook. He no longer wants to bring in outsiders, but instead stay and protect the people he already has. He has lost both Eric and Jesus, two men who meant the world to him, because of outsiders infringing upon his home. I can see Aaron turning this fight with the Whisperers into a vendetta, although it’s still possible that someone more levelheaded (Tara? Enid?) will be able to prevent him from going over the edge completely in his grief. It’s clear that Aaron isn’t the only one who will be affected by Jesus’ death, especially amongst those at Hilltop. 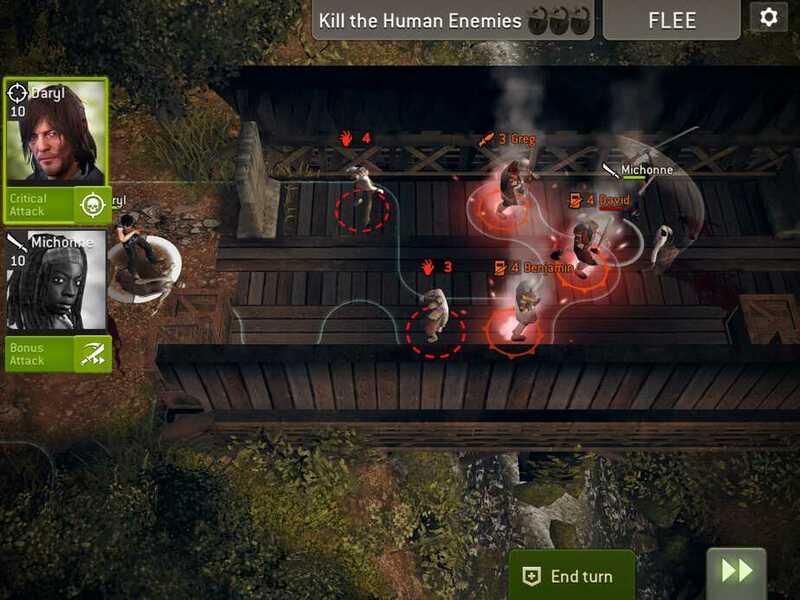 It’s likely that other deaths will follow as the Whisperers enforce their ‘territory’, and it remains to be seen whether this will cause people to want to fight back, or retreat into their towns and act on the defensive. So what do the Whisperers want? In the comics, they felt that the people of Alexandria/Hilltop/Kingdom had infringed on their territory, and in general bore a strong resentment toward those trying to ‘rebuild civilization’. This could be seen in the show when Lydia stated that walls couldn’t protect people, and that she and her mother had watched them fail before. The Whisperers have chosen to embrace living amongst the dead, using them as protection. 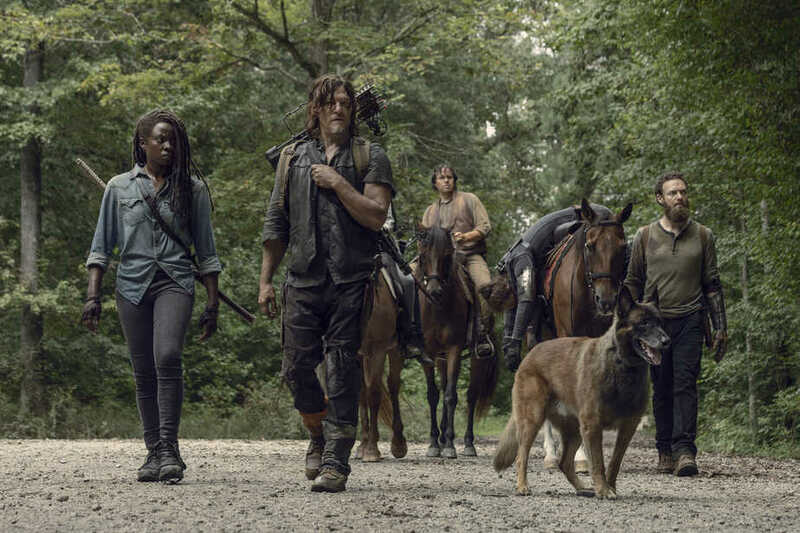 This is hardly a new concept in the Walking Dead universe: Michonne used 2 pet walkers as protection in the early days of the zombie apocalypse, and on Fear, Nick lived for some time covered in walker guts, moving amongst the dead in Mexico. We have seen many people temporarily covering themselves in walker guts to move amongst the dead. Yet the Whisperers take it to a new level. They are closer to revering the dead. Lydia told Daryl that the dead protect the Whisperers, and so the Whisperers protect the dead. Do they resent the Hilltoppers for killing the dead, or merely for killing their own? 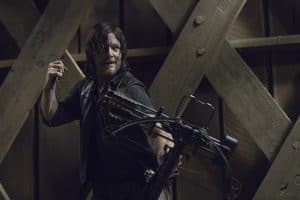 Daryl is smart enough to know that Lydia might be the key to unlocking the Whisperers’ secrets. He purposely went after her in front of Henry, setting up a situation where Henry could come to Lydia’s rescue, and creating a bond between them. He understands that Lydia might reveal more to someone she regards as an ally, even if only a temporary one. While the setup is different, it looks as if Henry will be taking over the role played in the comics as Carl connected to Lydia. 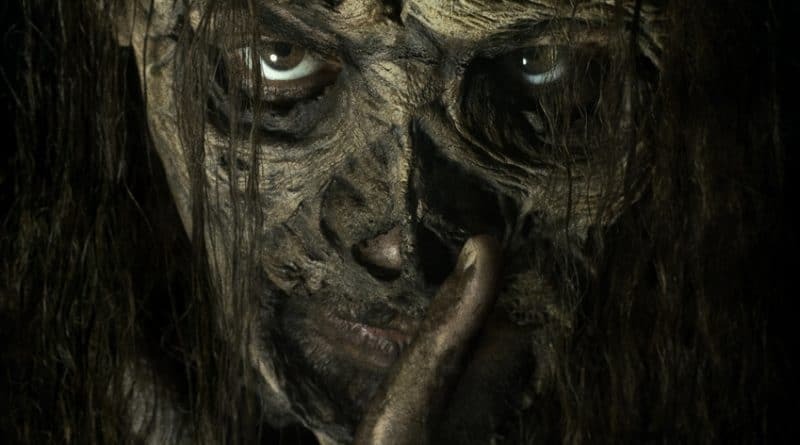 Of course, not everything in this episode had to do with the Whisperers. Negan had his own significant story arc. 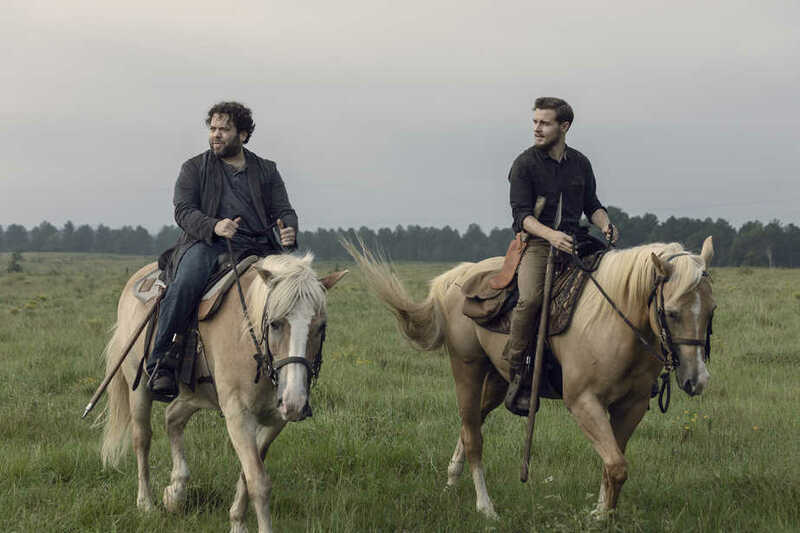 It was implied in previous episodes that he had gotten close to Judith, perhaps re-creating his affection for Carl by bonding with her. In this episode, we saw him attempt to say goodbye to her as she slept, yet he lost his nerve. Instead, he took her compass. This in itself seems odd. 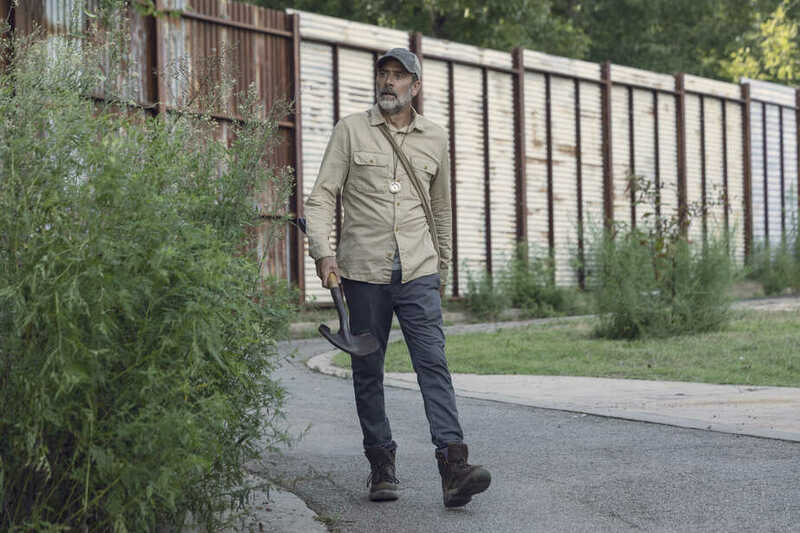 Negan knows the local communities, and if he’s leaving the area, he doesn’t likely have a particular destination in mind. Why would he need a compass? I believe that he took it as a memento of Judith, and not for its directional capabilities. Later, when Judith confronted him at the Alexandria wall, she told him that it would help him find his way. And in the end, it did. When Negan was at the Sanctuary, he realized that his old life was gone, that there was nothing left for him. Yet when he looked down and saw Judith’s initials on the compass, he knew where he had to go, and that was back to Alexandria. 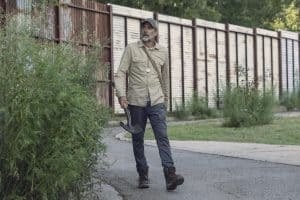 He could get himself a new leather jacket, wield a Lucille-esque pipe, even meet up with one of his old Saviors-now-walkers, but that isn’t who Negan is anymore, and it wasn’t a place he wanted to be. I’m still a bit confused as to why Judith let Negan go in the first place. While she is a kid, she seems hardened enough not to fall for Negan’s glib statements. My best guess is that she felt sorry for him. 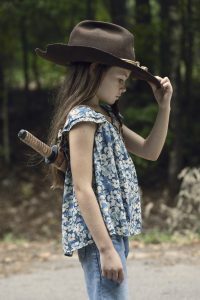 Judith is not old enough to personally remember the things Negan did in the war with the Saviors, nor did she have a personal connection with those whom Negan killed. Yet she does have a connection with Negan the man. As far as we know, Negan never had a child, yet clearly there is a part of him that longs to be a father, and is protective of children. 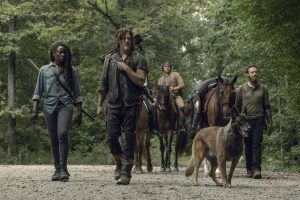 The connection goes both ways, and will likely turn out to be significant later on, especially if Negan takes on some of the storyline that he did in the comics. Another subplot that got buried in the bigger events of this episode was Rosita’s pregnancy. My, that woman has a lot of relationship drama! Apparently, before she got together with Father Gabriel, she spent some time with Siddiq. Which means that she can’t have been with Gabriel for that long, since the pregnancy isn’t noticeable, although she is wearing baggy clothes to hide things. I really feel sorry for Eugene, who is trying so hard to be forthright with his emotions, only to have Rosita trample on them again and again. Rosita isn’t the right person for Eugene, but I hope that he will find someone who is. As always, there were some humorous moments in the episode. I was amused when Eugene asked if the walkers were ‘the living kind or original recipe’, and I laughed out loud when I saw Daryl’s method of determining which walkers were ‘real’ and which were people in disguise on the bridge. Even Luke’s insistence on forming a 2-man-band with Alden was entertaining. Speaking of that band, that whole conversation was another reference to this fair coming up. It’s been mentioned quite a few times, in every episode since Rick’s departure. It’s pretty clear that this fair will be a major event in the lives of the Alexandrains/Hilltoppers/Kingdomites. But whether the fair brings good or ill with it (or perhaps both) remains to be seen. 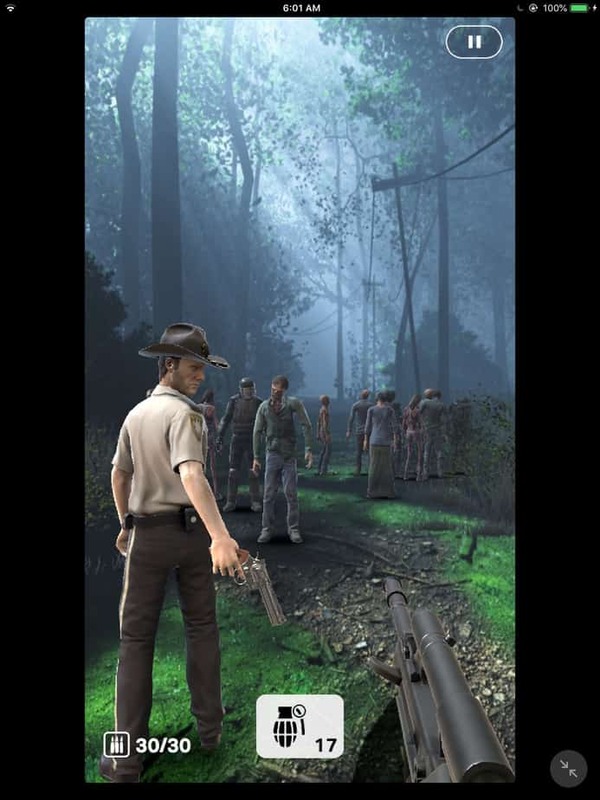 This half-season, both AMC-sponsored Walking Dead mobile games are once again running events every week. Our World will be saluting ‘iconic heroes’ every week, with special missions and earnable rewards. This week features Rick. No Man’s Land returns to provide weekly season missions, showing alternate versions of what happened onscreen in the episode. This week’s season mission features Daryl and Michonne killing walkers on the bridge, only to have 3 of them transform into living humans during the fight.